The natural and architectural ensemble of Stolac is part of the Tentative list of Bosnia Herzegovina in order to qualify for inclusion in the World Heritage List. 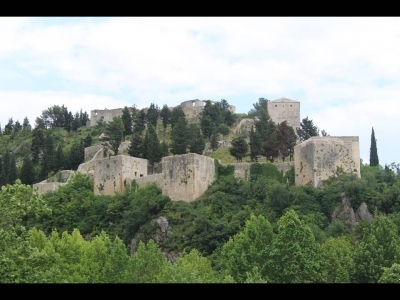 Stolac is already placed on the World Heritage map thanks to the Stecci. Indeed, the city possesses several Stecci and especially the Radimjla necropolis which is one of the greatest and most representative examples of these medieval tombstones. The town in itself is not very tourist-friendly as there are no infrastructures and sights are badly indicated. The city seems to be stuck in the post-Yougoslavian war state. We managed to see several churches, mosques and historic houses along with one old bridge. The town fortress dominates the wall city and seems quite massive. We did not have too much time to spend in the town and no real motivation to stay more (no restaurants open) so we left after a couple of hours in Stolac, We did not find any indication for the Hellenistic ruins of Daorson which seem, nevertheless, to be of big interest for the history of the region. Stolac is a town not far away from Mostar (about 45 minutes ride) and isn't very attractive in its own right. It used to be a charming Ottoman town but was largely destroyed in the Yugoslavian Wars and not yet reconstructed (plans are underway). There are the remains of a Turkish fort and that's about it. Surrounding the town, however, are several sites of different ages which are part of of the suggested nomination. Daorson is one of the only surviving Illyrian sites is only accessible by car and is very hard to find. It is situated on a mountain near some private farms. Most of it is destroyed but the cyclopic walls are highly impressive. They are extremely massive and designed to survive earthquakes despite the lack of any connecting material! Radimlja is a small easily accessible medievil graveyard with Old Bosnian Orthodox tombstones covered with different geometric patterns and knightly figures. This is the most famous of these very common graveyards spread in this area of Herzegovina. There is also a cave with some wall paintings but we unfortunately had to head back to Mostar and had no time to visit it.